Today's nuclear terrorism threats are significant. 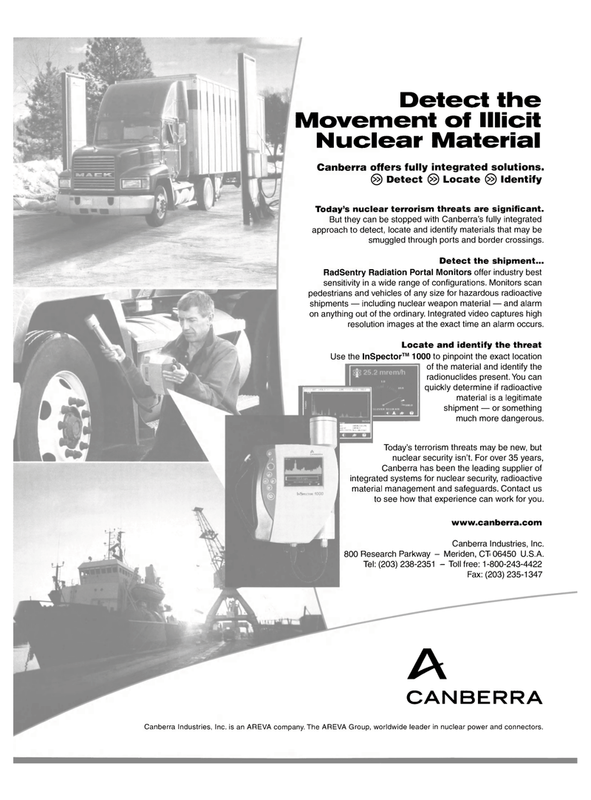 But they can be stopped with Canberra's fully integrated approach to detect, locate and identify materials that may be smuggled through ports and border crossings. RadSentry Radiation Portal Monitors offer industry best sensitivity in a wide range of configurations. Monitors scan pedestrians and vehicles of any size for hazardous radioactive shipments — including nuclear weapon material — and alarm on anything out of the ordinary. Integrated video captures high resolution images at the exact time an alarm occurs. Use the Inspector™ 1000 to pinpoint the exact location of the material and identify the radionuclides present. You can quickly determine if radioactive material is a legitimate shipment — or something much more dangerous. Canberra Industries, Inc. 800 Research Parkway - Meriden, CT 06450 U.S.A.
Canberra Industries, Inc. is an AREVA company. The AREVA Group, worldwide leader in nuclear power and connectors.